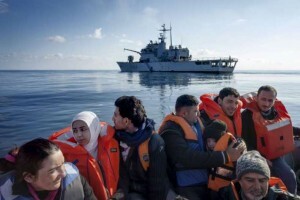 Syrian migrants rescued – Image from UNHCR. Recently I went to see Miss Saigon at the West End, a tragic musical set in the years after the Vietnam War. In one scene, the lead characters flee on a crowded boat full of migrants from dictatorship and violence in their homeland, risking their lives in search of safety. This suddenly began to look familiar. For those who have followed the Syrian civil war since its outbreak in 2011 the story is sadly well known: millions have fled, thousands by boat, but without the singing, dancing and comic relief. My interest piqued: how was the Indochina refugee crisis dealt with and what might we learn for Syria? Even a cursory investigation showed there was one standout difference between then and now: the western governments of that era put today’s leaders to shame. The late 1970s saw a massive refugee crisis in Indochina. Communist takeovers in South Vietnam, Laos and Cambodia, along with Vietnam’s wars with its neighbours created millions of refugees. By 1979 over a million had fled, mostly to Malaysia, Thailand and Indonesia, who housed them in camps. In the first six months of 1979 alone 209,000 refugees had arrived, including many ‘boat people’ that died making the perilous journey. Malaysia and Thailand, both overwhelmed, declared they would take no more. At the invitation of the UN Secretary General in July 1979, 65 countries came together at a conference where Western states agreed to accept 260,000 refugees a year. In the space of 18 months, more than 450,000 Indochinese refugees were resettled from camps to new homes in the west, mostly in the US, Canada, France and Australia. The scale of the Syria refugee crisis dwarfs that of Indochina. There are currently over 4 million Syrian refugees registered with UNHCR who, like the Indochinese have fled a vicious conflict and brutal dictatorship (whether Assad or ISIS) mostly to neighbouring Jordan, Lebanon, Turkey and Iraq. As these countries have become overwhelmed and increased restrictions on the refugees, thousands have resorted to boats across the Mediterranean hoping to make it to the EU. In a sad retelling of the Indochinese tragedy , today Europe has its own ‘boat people’ risking their lives to flee. According to UNHCR Syrians make up by far the largest number of the boat people, with the number crossing to the Greek islands close to Turkey peaking this summer. 160,000 migrants have crossed to Greece since January, 20,843 alone. 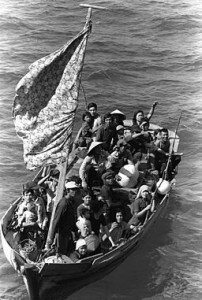 In contrast 27,000 were arriving by boat per month at the height of the Indochinese crisis. So where is the UN Secretary General and the conference to resettle Syria’s refugees the way western countries so admirably did in 1979? In December last year UNHCR asked members to pledge resettlement for 130,000 Syrians – half that asked for (and met) in the Indochina crisis. Yet the response was lukewarm at best. As of August 2015 73,863 places had been promised by western countries. A handful of states shouldered most, with Germany promising 35,000 places, Canada taking 10,000 and Norway 9,000. The US has offered a separate ‘open-ended resettlement’ to 16,286. Sweden’s relatively low 2,700 should not mask that it with Germany has so far hugely outstripped other EU members’ efforts (Sweden has 40,000, Germany 100,000). The most shameful figures came from France and Britain, two states that have been heavily involved in the Syria conflict, with France offering only 1000 places and Britain only 197 in its Vulnerable Persons Relocation Scheme. While many Syrians have come to Britain and France independently and then successfully claimed asylum, these are mostly the wealthy and/or educated and not the same as resettling refugees. This does little to ease the burden on those states hosting the most in need. So what has changed? Why were western states willing to resettle four times as many Indochinese refugees a year in 1979 as they have been willing to house in total from Syria? Westerners are no worse off or less capable of hosting refugees than they were in the late 70s. Taking arguably the worst offender, Britain, as an example, the economic situation then was not dissimilar to now. In 1979-82 Britain suffered a recession, far worse than the sluggish growth it has faced during the height of the Syria refugee crisis (2012-15). GDP per capita averaged $9k, comparable in today’s prices to the $40k it averaged in 2012-15, while unemployment averaged 7.5%, compared to 7.3% in 2012-15. In another parallel, in May 1979 a Conservative government under Margaret Thatcher came to power on a platform of rolling back the state, one seemingly emulated by David Cameron and George Osbourne today. Yet that government accepted nearly 25,000 Indochinese refugees, compared to 197 from Syria now. Two things stand out when comparing government attitudes to Syria’s refugees and those of Indochina. Firstly, there was a greater recognition of the refugees’ victim status. States with few historical ties to Indochina such as Canada (and indeed Britain) were willing to provide refuge (and relief for the overwhelmed host countries) out of a sense of moral duty. Today, that moral duty extends only to funding the host countries – Britain points to its generosity in this regard when deflecting from its poor resettling record. Yet politicians including the Prime Minister and Foreign Secretary don’t hesitate to use dehumanizing language about asylum seekers approaching their shores. Secondly, the western sense of responsibility for the refugees’ plight that drove proceedings in 1979 seems absent today. The US, which had a military presence in Vietnam for decades and bombed Cambodia and Laos, eventually took over 1 million Indochinese from 1979-97, while another combatant, Australia, took 185,000 and the former colonial master, France, over 100,000. Each seemed to implicitly accept some responsibility for the mess. Today, the US, Britain and France have all contributed to Syria’s civil war, providing political, economic, lethal and non-lethal support for the rebels. They may claim this was the morally right thing to do against Assad’s onslaughts, yet won’t extend the same morality to resettling the conflict’s refugees. Moreover, many of the destabilizing forces driving violence in Syria today – Jihadism, sectarianism, regional rivalry between Iran and Saudi Arabia – were the product of or greatly exacerbated by the 2003 invasion of Iraq by the US and Britain. Of course many of the other states who have helped fuel the war in Syria are just as bad, with Iran, Russia, Saudi Arabia and Qatar, having resettled barely any refugees (the Gulf states house many Syrians but, like Britain and France, mostly wealthier and skilled workers who have arrived independently). Yet this is not an excuse for a lack of leadership from western states and it would be much easier to pressure those states to accept more refugees once the west has done likewise. After years of refusing to deal with the problem, it is high time western leaders rediscovered the spirit of 1979 and took the lead. This article, alongside others by Christopher Phillips, can also be read on his website. Note: This article gives the views of the author, and not the position of the Euro Crisis in the Press blog nor of the London School of Economics. Christopher Phillips is a Senior Lecturer in the International Relations of the Middle East at Queen Mary, University of London and Associate Fellow at the Chatham House Middle East and North Africa programme. He has a PhD in International Relations from the London School of Economics specialising in contemporary Syria and Jordan. His first book, Everyday Arab Identity, was published by Routledge in 2012. In Greece, They Shoot Immigrants, Don’t They? This entry was posted in Europe, France, Germany, Greece, Migration, Turkey, United Kingdom and tagged asylum, Mediterranean migrant crisis, migrant crisis, Syrian refugees, UNHCR, Vietnames boat people. Bookmark the permalink. One Response to Syria’s Refugees: When did the West Become so Heartless? While not disagreeing with the general tone of this piece – that Western states have taken a morally reprehensible stance toward what UNHCR considers to be the biggest refugee crisis in its history – I think that it is easy to fall into the trap (common in refugee studies) of thinking that the response of European and other Western states to refugee movements today is restrictive in comparison with a generally more liberal approach prior to the end of the Cold War. Taking a closer look at the minutes of the various conferences called on the Vietnamese refugee resettlement would be interesting to see how the various organisations and states understood their “obligations” and the rationale behind what efforts they were willing to take and which they were not. The archives of the League of Nations and the United Nations (particularly of the Conference of Plenipotentiaries of 1951 and the discussions surrounding the creation of UNHCR) paint a rather less pleasant picture of the position of Western states in relation to refugees. Generosity and a real willingness to help – in the form of resettlement and assimilation – were a little further from the centre of the agenda than we like to believe, on the part of the states who developed the international refugee regime. Western states in particular have always been more willing to donate (on a strictly voluntary basis, of which they made sure) to relief programmes before providing resettlement in the West, and when resettlement was offered, it was usually for the economic benefit of these states themselves. Today, sadly, appears to be no real exception.